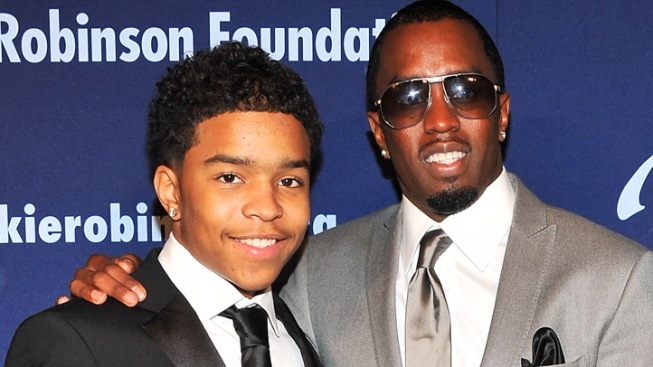 Justin Combs, here with famous father P. Diddy, is going to play cornerback for the Bruins. The latest recruit to UCLA football has a famous father who you may know as Diddy, P. Diddy, Puffy, Puff Daddy or Sean Combs. Justin Combs, a 5-foot-9, 175-pound cornerback who played his high school football at Iona Prep in New Rochelle, N.Y., committed Monday night to UCLA, according to Scout.com. The rap impresario's scion was reportedly recruited by such major college programs as Illinois, Virginia, Wyoming, Tennessee tech and Middle Tennessee State. Combs made the commitment on the same day the Bruins' coach, Rick Neuheisel, was getting fired. The team made the Pac 12 conference title game, but only because arch rival USC, which handed UCLA a 50-0 loss Saturday, is barred from the title game due to a scandal. He said he didn't mind the prospect of starting with a new coach "and a clean slate." His famous father was understandably thrilled. Scout.com rated Combs the 132nd best high school cornerback in the nation, and he made the Semper Fidelis All-America team. During this past season, he scored 12 touchdowns and took some snaps at quarterback in the wildcat offense. Combs told Scout.com he worked hard to attract the attention of colleges, and did not rely on his father's fame or influence. Earlier this season, Sean Combs made his presence known at a Gaels game, storming angrily onto the field after his son, who had relieved the team's struggling starting quarterback in the first half, wasn't calling signals in the second half. Iona Prep Head Coach Vic Quirolo waved the superstar off the field. Later, Quirolo told the New York Post Combs is the most dedicated player he's ever coached. Darla James, a Quirolo assistant, agreed. “He could be like every other rich kid, but you have to give him credit, he works hard,” James told ESPN. “His work ethic is tremendous, he is not a great football player because of his dad, it’s because of all the work he puts into his game." Editor's note: An earlier version of this story referred to the Pac 10 when it should have been Pac 12.